When white is needed in a container garden – and that white flower needs to last all the way into the end of summer – one plant you can count on every time is Euphorbia ‘Diamond Frost’. 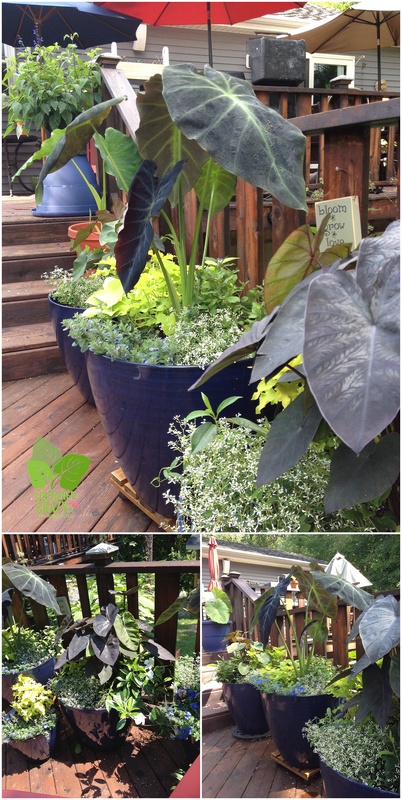 Just look at how delicate and gorgeous it is in this photo taken of a container garden up-close and personal above. 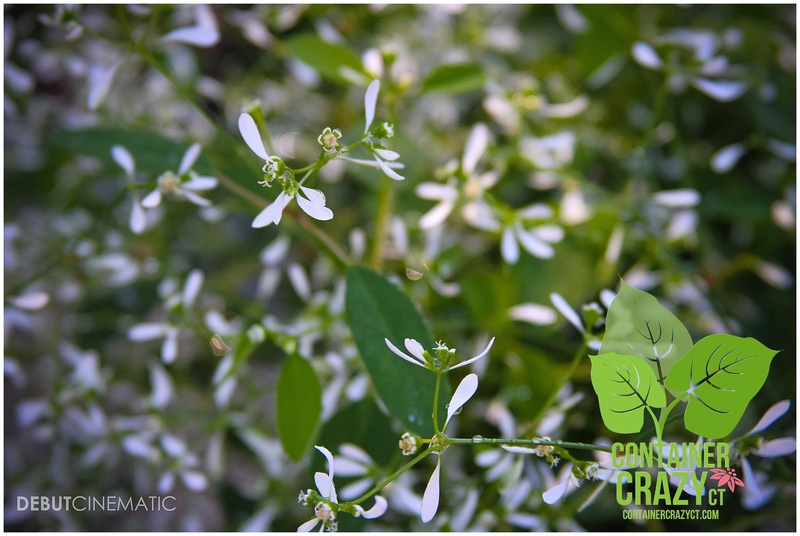 The soft, airy, and tiny white flowers (technically white bracts held above the green foliage) makes a perfect mounding candidate in container gardens as a filler plant. As I considered which plants to use in container gardens for a late summer wedding, the decision to use Euphorbia ‘Diamond Frost’ was not a difficult one. 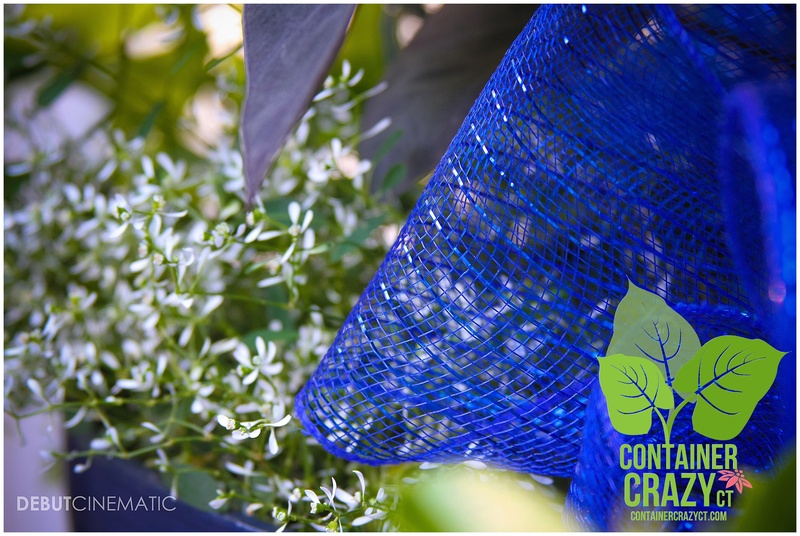 It is heat and drought tolerant and lasts from spring until the first frost of fall. What more could you ask for in a plant? This herbaceous perennial, treated as an annual in our Connecticut planting zones, is a member of the spurge family. 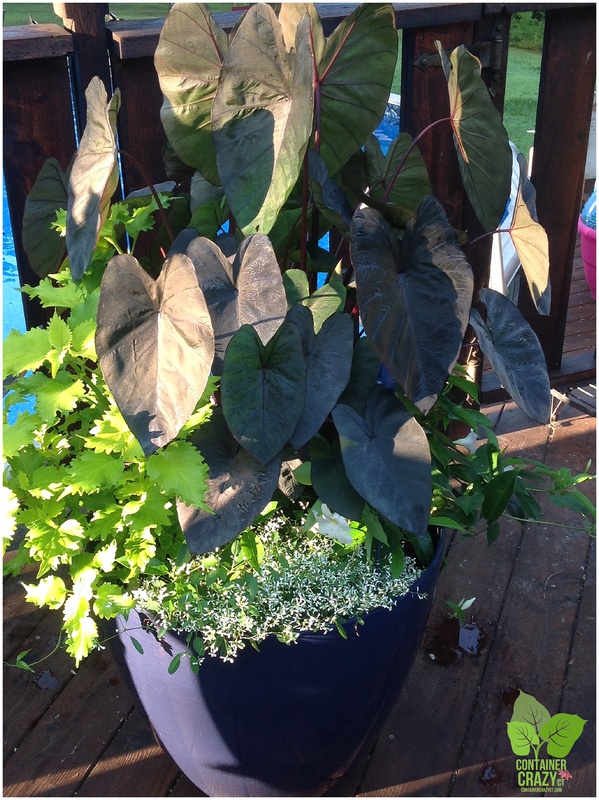 It is also an award winner, and can be used as a houseplant if brought in before the first frost of the fall, which usually hits in mid-October. 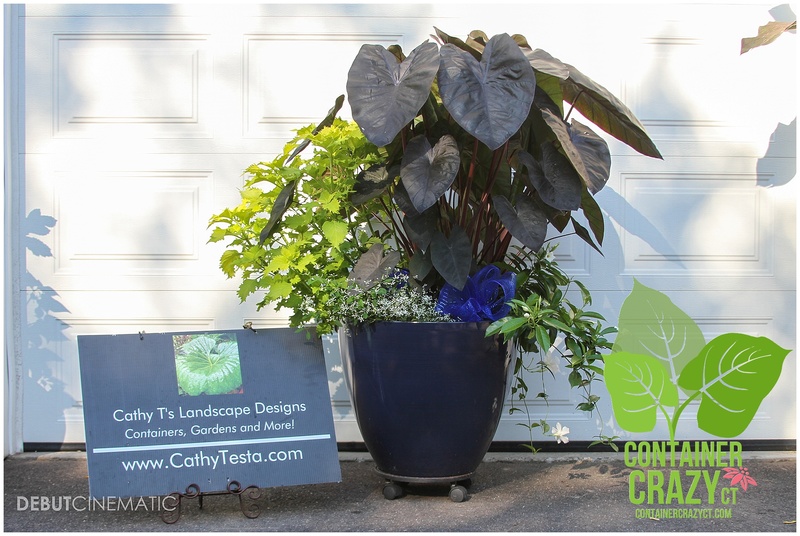 Other amazing attributes about this plant is it requires no deadheading, it is deer resistant, and adaptable to the landscape as well as container gardens. It takes part sun to full sun, and blooms constantly with little to no attention. 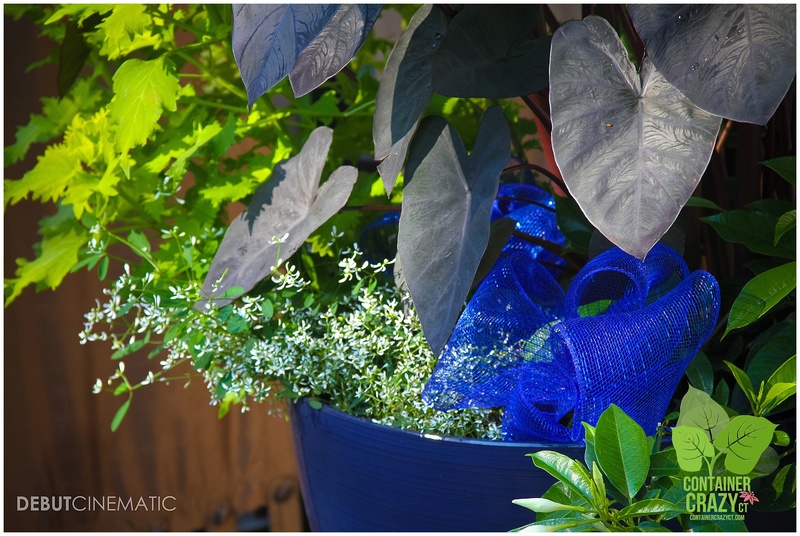 About the only concern to watch out for it is must have good drainage because it can rot in the base of a pot or container garden at the root level due to its delicate nature. I don’t think you could find a more elegant plant, however, to suit the setting of a wedding – Euphorbia ‘Diamond Frost’ is as beautiful as the lace on the bride’s wedding dress, thus this plants fits the setting and the mood. And the fact it was situated near some darker toned elephant ear plants (the thrillers in the container gardens) made the white delicate feature stand out. It is a plant to be used again and again every season. However, Euphorbia ‘Diamond Frost’ isn’t the only beautiful white flowering annual to use when you need a plant to last in a container garden until the first frost of fall, there are more white flowering plants with long-lasting attributes to be featured here soon – please, stay tuned. 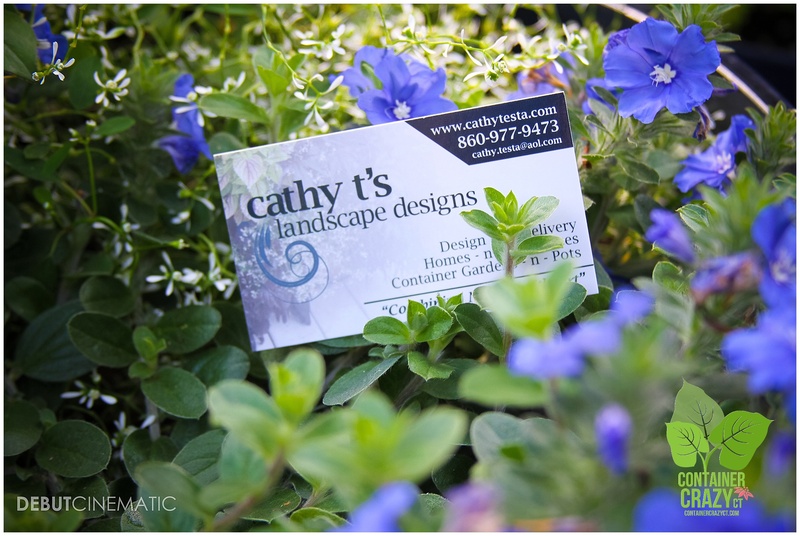 For Container Garden Rental Services by Cathy Testa of ContainerCrazyCT, click here. I share your excitement about the euphorbia. 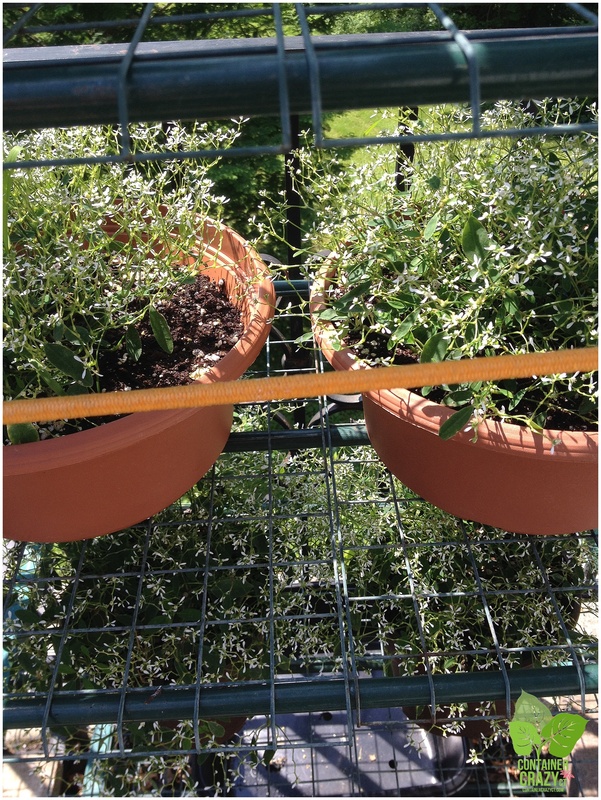 It has worked well in our pots. LOVE, LOVE, LOVED the blog on your sensor camera and the pictures of the fox and that Buck. I sooooooooooooo can not tell a certain someone about him ! Shhhhhh !!! You are one of a lucky few who get to witness the beauty of Mother Nature first hand in so many wonderful ways on your gorgeous slice of the woodland pie !!! Thanks so much for sharing !